Marine Pharmacognosy: Action of Marine Biotoxins at the Cellular Level focuses on the study and utilization of marine drugs. This book discusses the methods of isolation and characterization of bioactive agents, bioassays, microcalorimetry, voltage-clamp techniques, toxin-induced alterations, measurement of muscle contraction, and kinetics of toxin-induced hemolysis. Organized into nine chapters, this book starts with an overview of the use and usefulness of marine bioactive agents as research tools. This text then examines the pharmacological effects of maculotoxin, which are similar to those of tetrodoxin and saritoxin. Other chapters consider the role of choline in general cellular processes. This book discusses as well the rate of hemolysis as a function of prymnesin concentration. The final chapter deals with the features of the prymnesin–membrane interaction. This book is a valuable resource for pharmacologists, bacteriologists, zoologists, physiologists, botanists, and oceanographers. 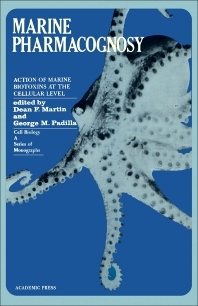 Scientists involved in biological oceanography and comparative physiology will also find this book useful.